Peanut fudge chocolate ring doughnuts Make these for the peanut butter-lovers in your life; they’ll thank you. 1. Pour the milk into a small saucepan and add the butter. Heat gently until the butter melts and the milk is warm, then remove from the heat. 2. Mix the sugar, flours, cocoa powder and salt together in a large bowl, then make a well in the centre and add the yeast. Test the milk temperature with your little finger – it should be warm but not hot. Pour the milk mixture into the well and leave to stand for 5 minutes to let the yeast dissolve. Add the beaten eggs, then mix with a wooden spoon to a smooth, very wet dough (almost a batter); set aside for 10 minutes. 5. On a floured worktop, roll the risen and kneaded dough to just under 1cm thick. Stamp out circles using a floured 10cm round cookie cutter, then cut out the central holes using a 4cm cutter (or an eggcup). Re-roll any trimmings and centres to make 12-16 rings. 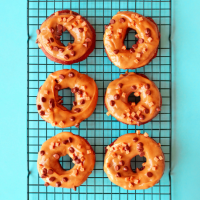 Transfer the doughnuts to the floured baking sheets, then cover loosely with oiled cling film and leave to prove in a warm place until almost doubled in size – about 1 hour. 6. When ready to cook, fill a large, deep, heavy saucepan ⅓ full with oil (or use a deep-fat fryer) and heat to 180˚C. Line a few trays with kitchen paper. Fry the doughnuts 2-3 at a time for 1½ minutes on each side, or until deep brown. Using metal tongs, transfer them onto the kitchen paper to drain briefly, then transfer to a wire rack; leave to cool. 7. For the topping, melt the peanut butter, golden syrup and butter together in a small shallow pan (take care not to let it boil). To coat, dip the doughnuts, face down, into the warm peanut topping, let the excess drip away, then return to the wire rack. Scatter over the chocolate chips and fudge pieces and leave to set. This recipe was first published in Wed Mar 01 15:37:46 GMT 2017.